While history has cast Adolf Hitler as a trailblazing propagandist, he has also been portrayed as a successful political campaign speaker—but does this narrative stand up to scientific scrutiny? Political scientists from the University of Konstanz and the Hertie School of Governance have now revisited the question as to how effective Adolf Hitler's public campaign appearances were in garnering electoral support in Weimar Germany. Research findings, to be published in the American Political Science Review (APSR), suggest that Hitler's appearances actually had a negligible impact on the Nazi's electoral fortunes before their seizure of power in 1933. Five German parliamentary (Reichstag) elections and one German presidential (Reichspraesident) election were carried out in Germany between 1927 and 1933. During this time period, the National Socialist German Workers' Party (NSDAP) increased its vote share from a marginal three to an extraordinary 44 percent. 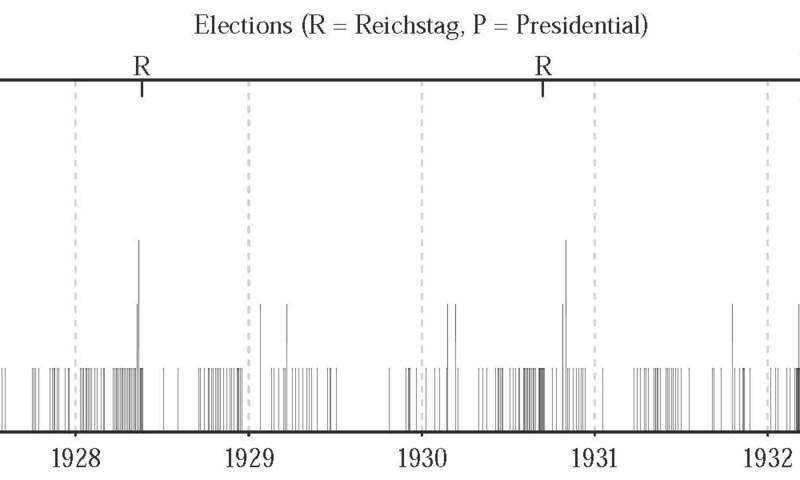 New research results from Professor Peter Selb at the University of Konstanz and Dr. Simon Munzert from the Hertie School of Governance show, however, that Adolf Hitler's 455 public appearances during this period had a surprisingly small effect on the electoral outcomes. Peter Selb and Simon Munzert base their findings on election statistics from 1,000 counties and districts as well as from 3,864 municipalities. For their analyses, they include information on Hitler's campaign locations, attendance figures at individual events, and NSDAP party membership numbers. They also take into account campaign event appearances of Joseph Goebbels—the second most important speaker for the Nazi movement. 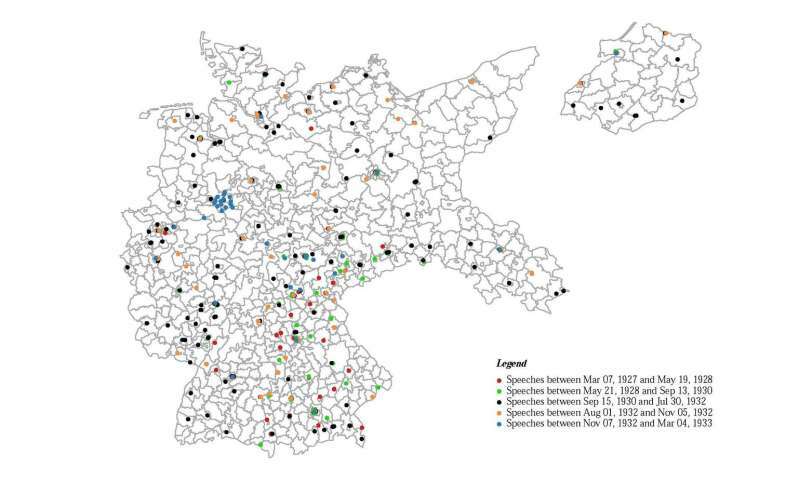 By using the statistical method of "difference of differences" (DID), the researchers compare election trends in areas where Hitler gave public speeches with the electoral trends from similar areas where he did not appear. "We are surprised about how marginal the effect of Hitler's election appearances was, especially when one considers contemporary witnesses and historians who have confirmed his exceptional rhetorical abilities," explain Selb and Munzert. Overall, their data assessment demonstrates only minor electoral effects, which were very limited in terms of geography and time. According to the researchers, Hitler's personal involvement only had a positive effect in the run-off election for the office of German president in 1932. This election took place after an unusually short, intensive and one-sided election campaign—competitor Hindenburg did not make any public appearances—leading Hitler to garner an estimated additional one to two percentage points in terms of vote share in counties and districts in the immediate vicinity of locations where he made a public appearance before the election. The fact that Hitler's campaign is considered a most likely case for campaign effects makes these results all the more extraordinary. In contrast to his political rivals, Hitler utilised new and sophisticated techniques, including modern technology such loudspeakers and airplanes, with which he traveled throughout Germany. These provided Hitler an unparalleled geographic penetration and an unprecedented level of public attention. "It is remarkable that Hitler's public appearances and speeches as an early populist and party leader were not very influential, especially when one considers the growing body of empirical evidence confirming his propaganda successes as dictator," explain Selb and Munzert. Research on Germany after 1933—when the Nazis had begun to gain totalitarian control over the state apparatus, societal organizations, and the emerging mass media—has demonstrated that Nazi propaganda had strong and long-lasting effects on the collective perceptions, attitudes and behaviour of people. According to Selb and Munzert, "other studies stress the crucial role that economic and political circumstances played during this time—which includes mass unemployment and economic hardship, a lack of support for democracy, the alienation between established parties and the electorate, as well as weak state institutions—for the rise of the NSDAP. When compared to these conditions, we can confirm that Hitler's importance as a charismatic speaker is less significant." Based on this historical evidence, the researchers recommend viewing with skepticism the accepted opinion that charismatic leaders play a key role in the rise of right-wing populist movements.